Rhys Vineyards was the darling of the wine press several years ago when the winery burst on the scene, as the wines showed signs of unrealized promise for California Pinot Noir and Chardonnay. The initial vintages had very low production so few consumers experienced the wines. I was enamored by the earlier vintages because of their low alcohols and impressively ripe phenolic flavors, but the latest release of the 2010 wines surpass most of the wines that preceded, and they have reached new heights for California Pinot Noir. All the sweat and financial commitment at Rhys is beginning to pay off. Pinot Noir loves to be coddled, and God knows that Rhys has nurtured the fickle grape with utmost care. Today, Rhys is producing distinct wines that are unlike any other produced in California. 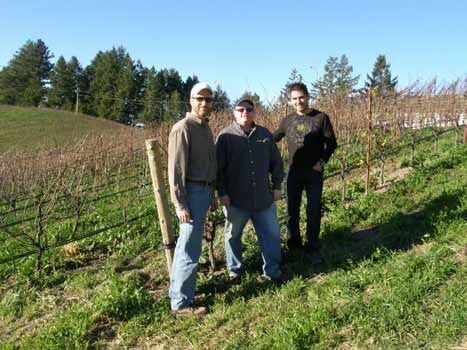 Over the years, owner Kevin Harvey and winemaker Jeff Brinkman have refined their style and today the wines have reach the pinnacle of California Pinot Noir. 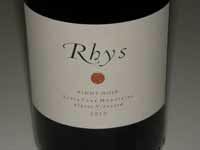 The three 2010 Rhys Vineyards Pinot Noirs and Chardonnay, the fall 2013 releases and the last of the 2010 single vineyard wine releases, are reviewed here. They are outrageously good. I only wished I had bought more of them. Kevin recommends cellaring all Rhys wines for 5+ years to reveal their full personality, although he admits the 2010 wines are ready to drink earlier. He also recommends decanting the wines for at least an hour before serving which I did before I reviewed the wines. Chardonnay plantings at Rhys have increased steadily since a single acre was planted at Alpine Vineyard in 2000. Currently, there are 2.75 acres at Alpine Vineyard, 4 acres at Horseshoe Vineyard, and 8 more acres at Bearwallow Vineyard in the Anderson Valley (the first release will be from the 2013 or 2014 vintage). The Chardonnay vines have been planted in some of the best soils and with the best exposures found at each site. The vines are tightly spaced with low vigor rootstock onto which they have grafted a massale (field mixture) of heritage selections of Chardonnay. The tight spacing forces the vines to fully explore the soil profile and produces very small berries, while the mixture of Chardonnay selections contributes to an orchestra of expression. 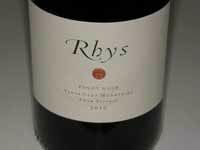 The 2014 spring offering will include all the Rhys Vineyards wines from 2011 which were produced in very small quantities. Sign up for the mailing list at www.rhysvineyards.com. The winery is not open to the public.